For sculptor Sylvette Chanel, Advent is the busiest time of the year. She is among the few people left who keeps alive the ancient New France craft of making and repairing wax Jesus figures for Nativity scenes. This art was brought to Canada by the first female religious congregations more than three centuries ago, Chanel explained Dec. 17 at a conference at Maison Saint-Gabriel, a Montreal museum. The nuns practiced it, preserved it and passed it on to some of their members. But with the decline of these congregations, Chanel, 77, is doing her part to preserve it. She learned the basics of this tradition from Misericordia Sister Sylvia Rondeau, who died in 2013 at the age of 92. In the mid-1980s, for three years, Chanel regularly went to the Misericordia motherhouse in Montreal to watch Sister Rondeau work. Chanel said she has created hundreds of baby Jesus figurines over the years. “Every child Jesus needs a good day’s work,” she said. 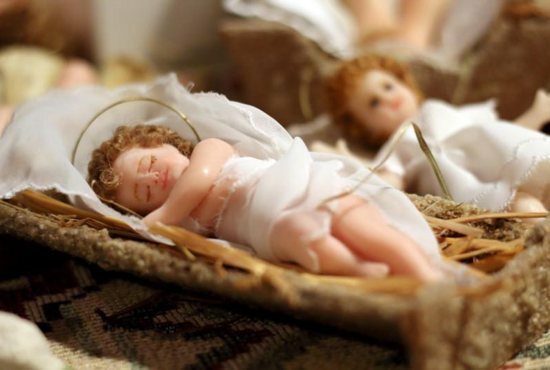 On her desk were a variety of wax baby Jesus figures, just like the ones so many parishes and families own. “Some parents still ask me today to prepare a wax Jesus for each of their children, using a lock of their (children’s) own hair when they were very young.” Specialists also order figurines. Chanel starts by preparing and melting beeswax and pours it into a mold. When it solidifies, she unmolds the figurine, gently removes the excess wax, dresses it, prepares its hair, places his halo, and paints its eyes. Her primary tool is the little knife Sister Rondeau gave her. The artist likes to give a smile to the figurines she molds, to give Jesus a serene look. “I am convinced that he was not born sad,” she said. Every year, in November and December, people ask her to repair a wax Jesus that fell or was improperly stored. “Some come to me all broken. I am the 911 of wax Jesuses!” she added. “I work miracles, it seems,” especially since some figurines were made many years ago. “Time and light affect the color,” she explained. But after Chanel’s touch, they’re back in the crib, with a serene smile.